Merrill Street didn’t always dead end into Meridian Street. The unassuming lot dabbed in trees today betrays no hint of its bustling former life. Merrill Street continued east, all the way to Noble (Noble later became College). That’s not all– what was 601 South Meridian once welcomed untold throngs to Congregation Sharah Tefilla. 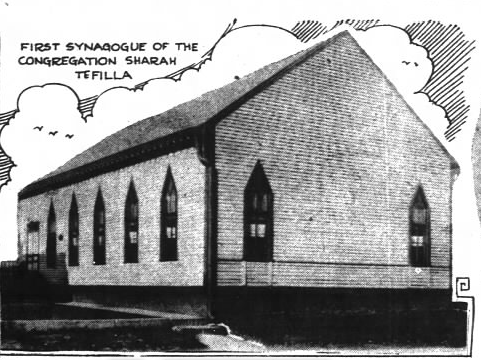 “Sharah Tefilla” translates to “Gates of Prayer,” and membership for this south side Jewish Orthodox synagogue was officially chartered in September 1882, though further south on Meridian. A number of Jewish communities and congregations were a key part of the culture on Indy’s south side. What might be referred to as a “transitional” area today, the south side at the time, was less expensive, more industrial, and the human makeup of the area included Irish, German, and black settlers. Sharah Tefilla was the first of the south side shuls, with meager beginnings in the early 1870s, characterized as little more than a prayer group. Monikered the “polische shul” due to many members’ Polish origins, for several years the congregation migrated through a number of rental spaces around the south side–for these purposes, “south side” means: between Morris Street on the south, Capitol on the west, Union Street on the east and Washington on the north. Frequently changing both spaces and rabbis in its earlier years, the congregation was by no means secure. But they were always on the south side. When Sharah Tefilla membership was officially chartered and operating from its full-time South Meridian home, things stabilized. The congregation’s membership was made up of a number of immigrants from eastern European communities and regions. There were other synagogues in the neighborhood, and each differentiated by the national origins of their members. The congregation celebrated its 50th anniversary in 1932, and the tradition continued until 1966. 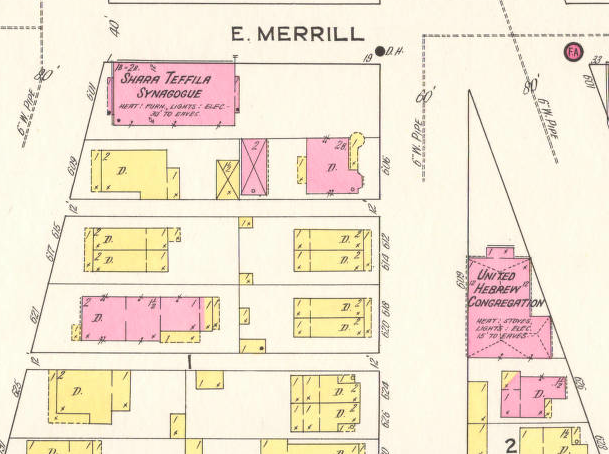 Below, the 1915 Sanborn map, courtesy IUPUI Digital Collection, shows nothing behind the synagogue, and Merrill Street still goes through to Union Street, and beyond. 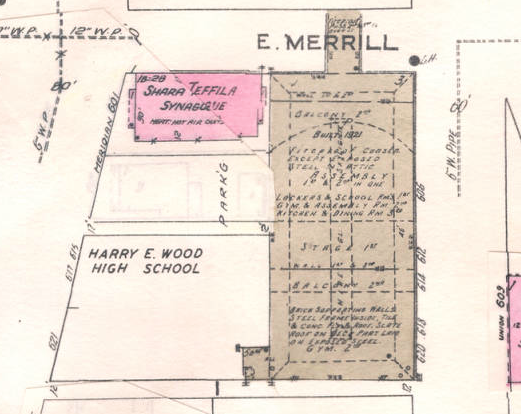 By 1956, the Harry E. Wood High School was behind the synagogue. 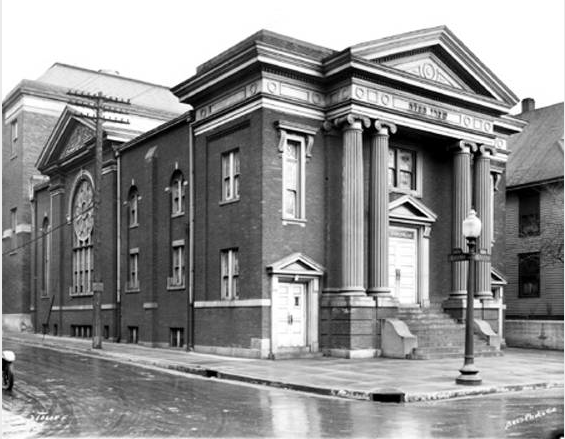 The congregation merged with two other congregations in 1966, becoming part of the New United Orthodox Hebrew Congregation, located at 5879 Central Avenue. The closing service was held at 1pm on Sunday, February 13, 1966. 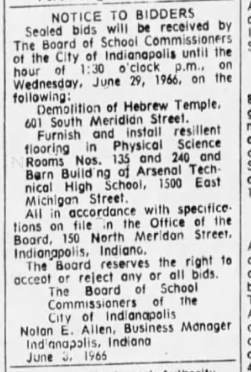 We may infer that the school adjoining the property acquired the relinquished building, since the following classified ad appeared on June 17, 1966. Nice article! As an interesting connection, the neighborhoods around these synagogues were like little villages of Jewish immigrants form the various European countries. In particular, I am referring to the Union Street area, near and south of Shapiro’s restaurant, that was bisected by the Interstate highway. These were thriving cultural, close knit communities, that eventually was lost to typical movements away from the urban environment to the northern suburbs. There are fewer and fewer living past residents of these neighborhoods; if you know of anyone who would like to hear a first hand reflection of those neighborhoods, I would suggest they should contact Max Nelson, of Aaron-Ruben-Nelson Mortuary, who grew up in the Union Street area, and can still describe the life and the community that was lost. Enjoyed the article. At one time the south side was a thriving Jewish community. Five synagogues…two kosher butcher shops…Two bakeries and several department stores. 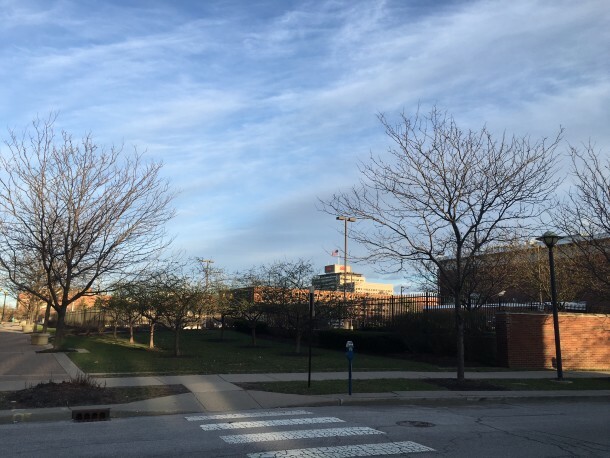 The Jewish population gradually moved north (Shortridge High School. I grew up in that neighborhood. In fact both my older sister and I worked for one of the small Jewish department stores. 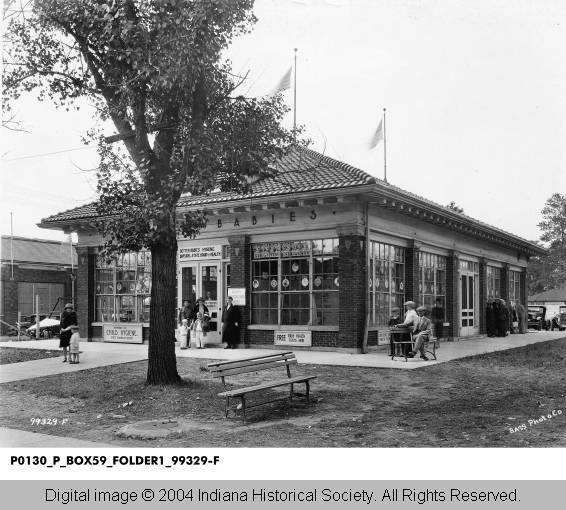 Most of the businesses between Merrill St. and Morris St. on S. Meridian were owned by the Jewish Community. Many of them had parent’s who had lived ‘over the store’ when they first emigrated to America and by the 50’s had moved to northern suburbs. The interstate swallowed nearly all of that community, including the home I was born in and another I was raised in. There was a tiny little synagogue on W. Morris and S. Church Street’s northwest corner and a good sized Episcopal Church across the St. from the Synagogue. 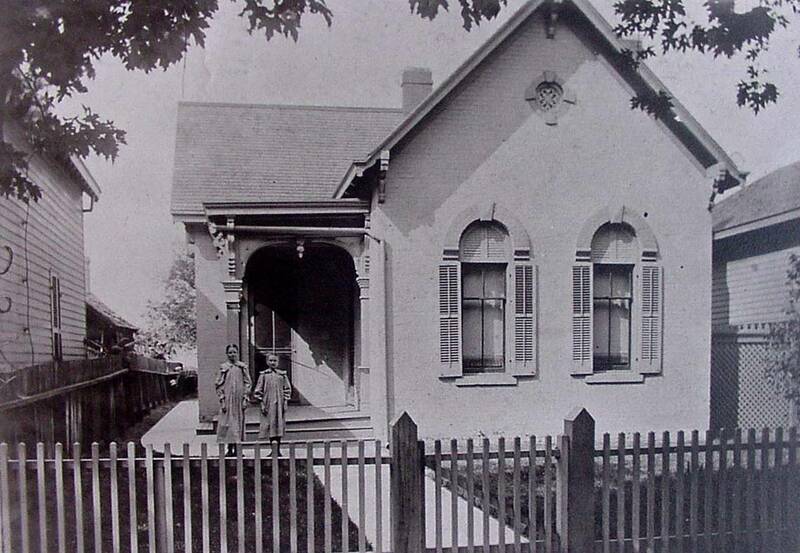 My godmother and great aunt lived next door to the synagogue and she was a member (as was I) of that church. She would go in an hour before the synagogue services and turn on the lights and the heat. I don’t know how that arrangement came about but she was an angel on earth so I wouldn’t be surprised that she offered. The Jewish community was intermingled with the Irish, African American and German community. I recently learned it was a ‘red lined’ community which meant it wasn’t earmarked for any govt.l spending on infrastructure or community development, yet it was a pleasant community for a very long time. My Irish ancestors came in at the beginning of the 19th century. There was Passo’s drug store, Shapiro’s Deli, (still there only larger) Kraft Bakery, Efroymson’s Dept. Store, Safrin’s Dept. store (where I worked as a teen), Zuckerburg’s Dept. Store, Sablosky’s Dept. store. a Shoe Repair shop. Two taverns. Several small retails that sold poultry, kosher meats, and other’s I no longer can recall. There was also a Vonnegut’s (of the Kurt Vonnegut family hardware chain) within those blocks as well. And a Goodwill store. I’ve lived on the coast of Maine for several decades now and I’ve really enjoyed this site’s pieces on the “old South Side” being so very far away from that neighborhood now. Most of my extended family remains in Indianapolis suburbs.